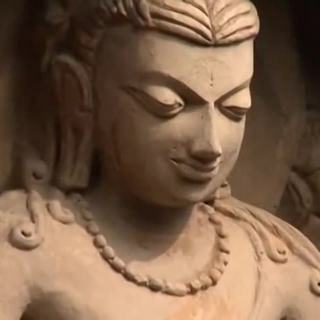 This is another excellent documentary by one of India’s leading art and cultural historians Benoy K. Behl, whose work I have featured many times on this site. Behl is best known for his photographs of the murals of Ajanta, which propelled him to fame in the early 90s, and has also written and hosted many documentaries for Doordharshan in India. As a result of his contact with Buddhist art he became a convert to the Vajrayana school of Buddhism, and has done much work to illuminate the traditions of that school, as in this film made for the Indian Government Diplomacy Initiative. In it he discusses the close connection between the great medieval Buddhist monastaries in India and their legacy in the Tibetan tradition, which is directly linked to so many of the great masters who were teaching in those centres. In so many facets of Tibetan monastic life and philosophy we see the imprint of these instititions, whether it be the intensive scholarly learning, the debates or the reliance on the schools of thought that developed during that time. This is a fascinating film, which helps us to understand that although Buddhism and Buddhist Instiutions died out in India, they were preserved – and well preserved – in Tibet, and have now once again returned to their home lands. In the film various monastics and scholars appear discussing these themes, inclduing HH The Dalai Lama, Dr. Jeffery Durham, Prof. Samdhong Rinpoche, Geshe Dorje Damdul, T. G. Rinpoche, Dr. Hirapaul Gangnegi and others.